From small beginnings in Cork city in 1775, it was remarkable that the order grew so quickly. Killarney, Co. Kerry in 1793, Dublin in 1794, Wateford in 1799, another house in Cork in 1799, Kilkenny in 1800 and Tralee, Co.Kerry in 1809. Only in 1800 had Pope Pius VII raised the Congregation to the status of a Religious Order. In 18th century Ireland Catholicism was so persecuted that the teaching of Catholic children was a punishable offence. In those difficult timers, a brave woman, Nano Nagle, defied the might of the British Empire and set up a series of secret schools in the city of Cork, in Ireland. There she provided teachers for the many children and took personal responsibility for the instruction of the children in their faith. 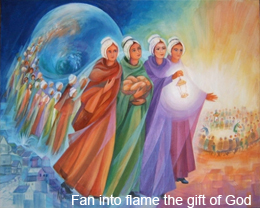 She became the friend and support of the poor and needy and came to know every poor dwelling in that city. To ensure the continuation of her work, on Christmas Eve, 1775, she beacame the foundress of a religious Congregation of women. She began with only three companions. Today the daughters of Nano Nagle number about 3,000 and serve in every continent of the world except Antartica. We are an international multi-racial Congregation. Our Generalate is located in Ireland. One of our newest ventures is in Slovakia, where we have been since 1992.